A time of day and a frame of mind...come early or come late, but either way prepare yourself for the romantic prismatic colors of sun, clouds and landscape. Come to the Southwest at sundown. The oblique rays of the sun light the undersides of the clouds and shower a prism of beauty on canyons, flowers and homesteads alike. Then add a desert monsoon and a cruising hawk for awesome drama. Be sure and check our other galleries; they overlap a little. For your convenience, we've placed only a few images on each page of this gallery. When you are ready, go to page 1 or page 3 in this Gallery, or use the tags at the top to view other galleries on our site and place your order. Night of the Hawk©. The night belongs to the Harris hawk perched briefly for the sake of reconnaissance on a giant saguaro cactus as sunset crosses the Sonoran Desert. The Tucson Mountains appear in the distance, but this hawk is clearly hoping that a midnight snack may be much closer, perhaps hopping through the brittle brush and creosote bush below. Pusch Ridge© is a gigantic westward protrusion of the Southern Arizona’s Santa Catalina mountains. The head of this sky island range is often veiled in snow, while the foot is planted firmly in the surrounding warm Sonoran Desert, creating a distinctive weather pattern. 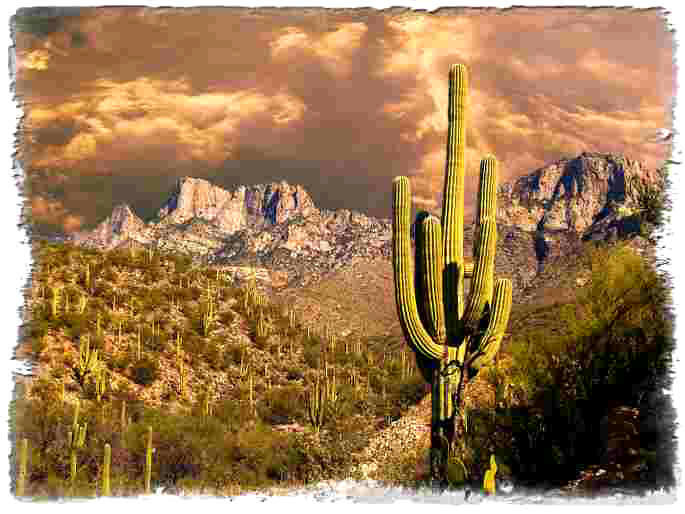 Here the final clouds of the evening seem to boil from the rugged mountain tops, observed quietly by a tall saguaro. Rider in the Sun©. In the Southwestern Arizona desert, the sun has just set. 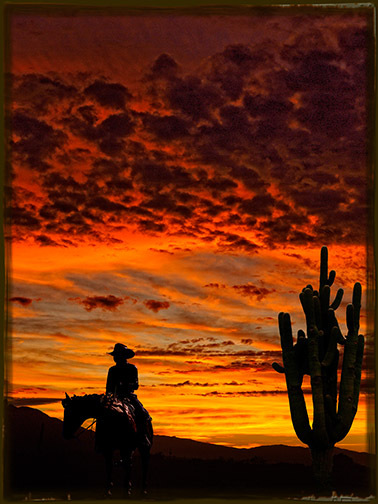 There is still a glint of the sunset on the back of the lone cowboy heading home. 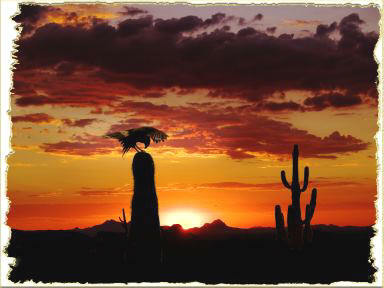 The tips of the saguaro are also lit, guiding him home at the day’s end. 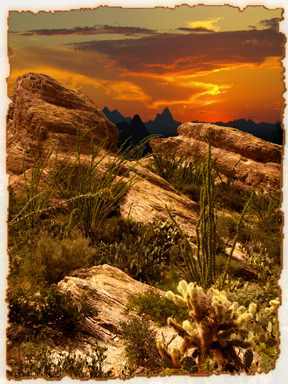 Rough Country© describes this evening scene at Saguaro National Park. The sunset to the west produces a glow that reflects off the rocks and warms the prickly pear, teddy bear cholla, and ocotillo. The Tucson Mountains are silhouetted in the background. Scattered Showers© are the rule in monsoonal Southern Arizona. In the midst of summer heat that sometimes seems interminable, the clouds form over the mountains and drift slowly across the land. 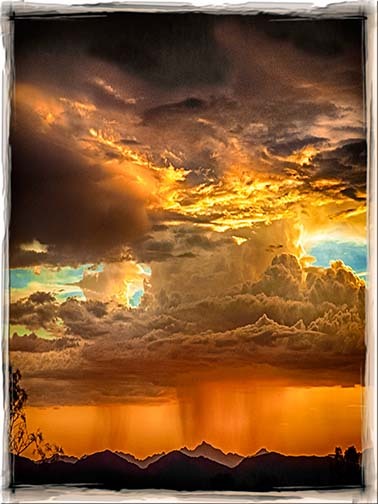 And wherever they go, the refreshing rain brings the promise of a cool evening filled with the rustle and whistle of birds and the scratching of the enlivened coyotes and javelinas.